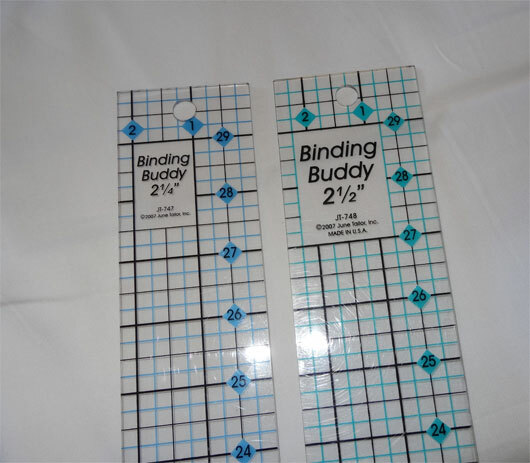 How Wide Do You Cut Your Binding? 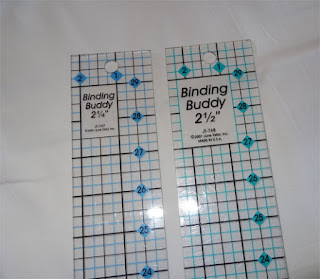 Funny - I thought I'd mentioned my favorite quilting tool, the one I treasure the most (other than my longarm, of course), but looking at my old posts, I just realized I've shown it, but never done a post about it. It's my little lucite "Binding Buddy" ruler. bought it in May of 2011, while visiting my cousins in Florida, and it's been my most treasured tool ever since. It's 2.5" wide and 30" long - just perfect for whipping through 45" fabric folded in half. My quilting buddy Sharon saw it and wanted one, so I got one for her. I didn't really look at it when I got it - but last week I happened to pick it up and - hey!?! What's THIS?!?!?! My binding buddy is on the right. Sharon's is on the left. Do you see what I see? Sharon's rule is 1/4" more narrow than mine! Oh, NO! What's up with that? Well - I was worried sick that the smaller width would make binding that's too narrow... ...so I used her ruler to cut out the binding for my most recent project. And guess what! 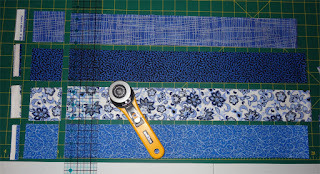 Cutting the binding 1/4" more narrow actually yields binding that sits nicer on the quilt! Once the binding is folded in half and stitched to the quilt edge (with a 1/4" seam allowance), it flips over the edge and lines up perfectly with the stitch line on the back - no "floppy" bits, but a nice snug fit. With 2 1/2" wide binding, there's a little flop of excess. It never bothered me before, but I've never really thought about it. 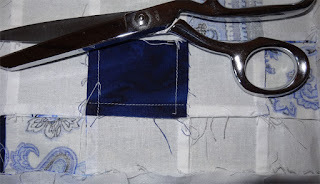 From here out, I'll be cutting my binding a little more narrow! 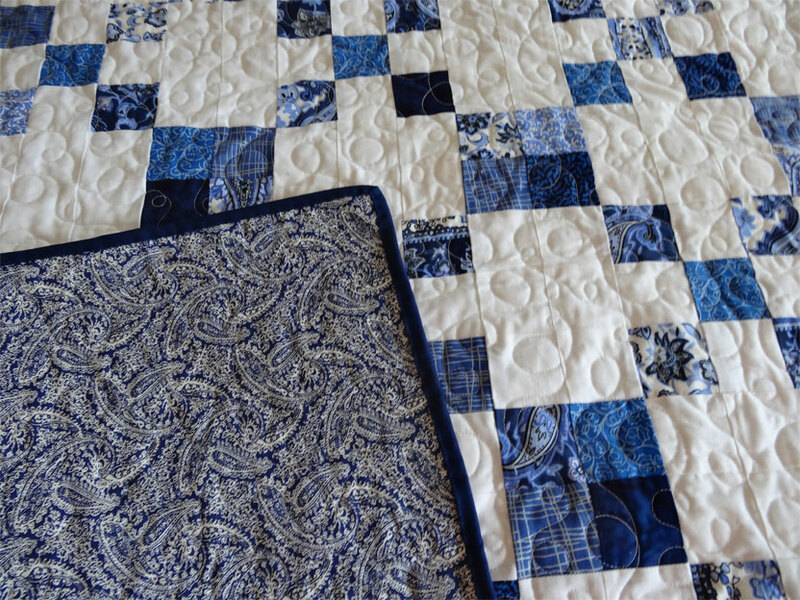 Quilt 57: Jelly Roll Nine Patch Plus - DONE! 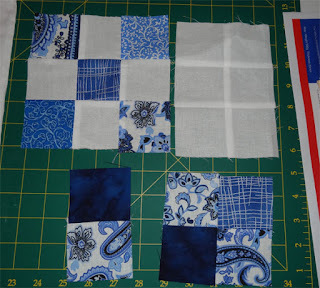 It didn't take long at all to cut out the required squares from the strips in the jellyroll pack. And, below, I've started joining the nine-patches. The one concern I had about this quilt was making sure the dangling threads unraveling from the darker squares. As you can see below, one little dark thread really shows up against the white background - I didn't want those threads to show through the finished quilt, so I took a little extra time and trimmed them away. 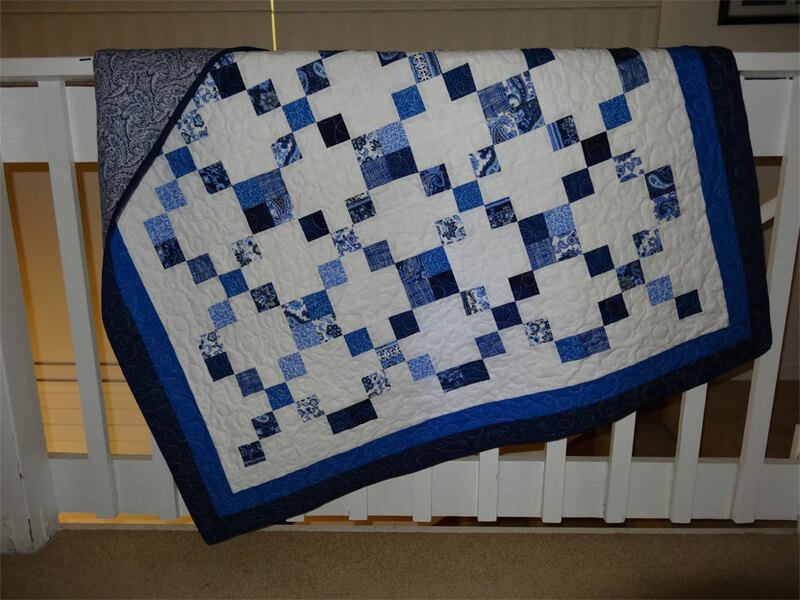 I opted to quilt this using a simple "loop-d-loop" free-motion design - and oh, my it only took a couple of hours to finish the quilting! 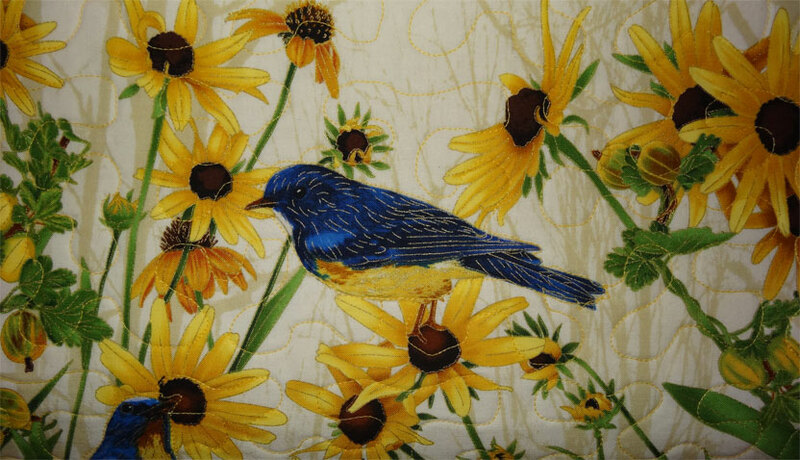 100% cotton fabric with cotton batting, quilted on the longarm. And a close-up of the quilting pattern - and the background fabric. I finished it just this morning! This one goes to "Inspirational Quilts". 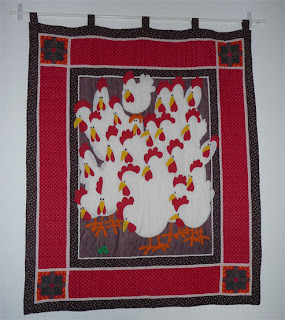 Back about 20 years ago, my mother gave me a very funny wall hanging she'd made from a pattern she'd found. 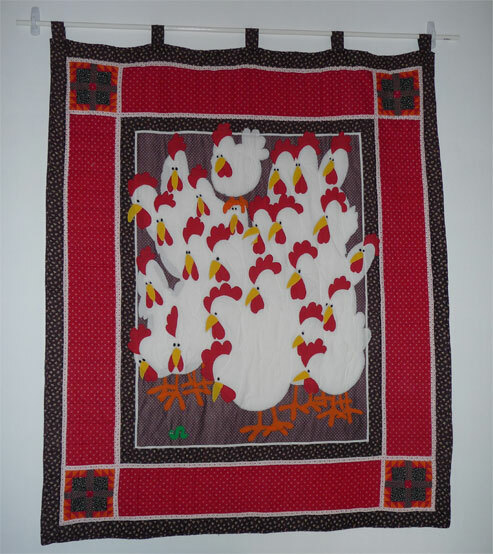 "The Chicken Quilt" really is cute - all those hens standing around staring at a lone green worm (who is looking back at them). Depending on how you felt, you could be the chickens or the worm. It's clever, and I hung it in my office when I was still living in Ohio. Back in 2010 my mother-in-law allowed hubby and me to take over her spare bedroom and outfit it for ourselves to stay in during fire season, when the fire danger where we live is too great. We painted the room white and I hung the quilt on the wall over the bed (and Judith thought the quilt was hilarious). 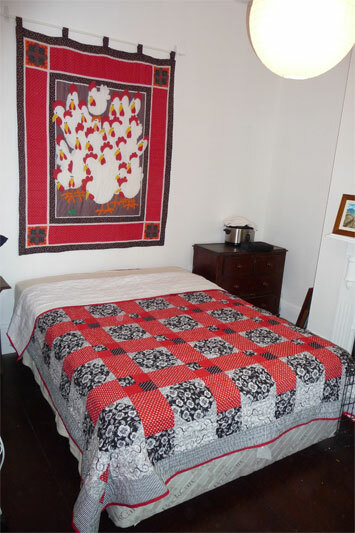 I wanted a bedspread with similar colours and couldn't find one - and that's what got me started quilting. Here's the Chicken Quilt hanging over the bedspread I made (my first quilt project). The wall hanging and bedspread have been there ever since. I have to admit that I no longer really look at the wall hanging, and am ready to change the room. We're changing the whole house, as a matter of fact, having hired an architect and builder to do a massive renovation there (his mother passed away in 2010 - but we kept the house as a second residence and our "bolt hole" on high-fire danger days). So over the past few weeks, we've been gradually sifting through everything in the house and preparing to empty it in advance of the renovation. Yesterday I finally got around to working on that bedroom and well, I decided it's time to let go of both the bedspread and the wall hanging. I don't really want them anymore, and there's nobody in the family who I know of who wants them, so I folded them carefully and donated them to the "op shop" run by the Brotherhood of St. Laurence. Both pieces are clean and in good condition, and it makes me smile knowing that they will certainly be snatched up by someone who will really get pleasure out of them. 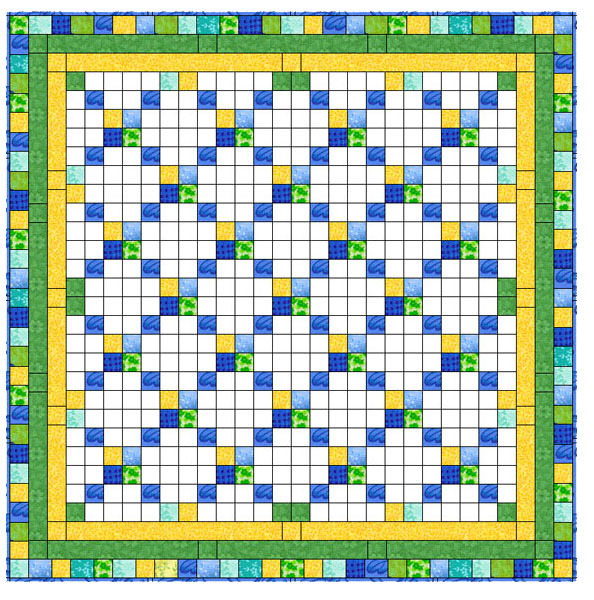 I came across this jelly roll at my favorite quilt shop - and just fell in love with it. What does your eye see here? 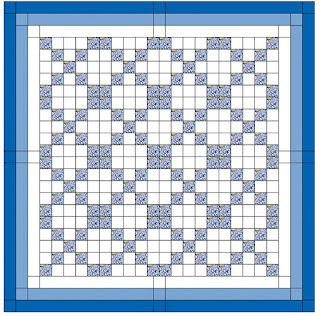 My eye sees groupings of 9-patch blocks with 4-patch blogs. 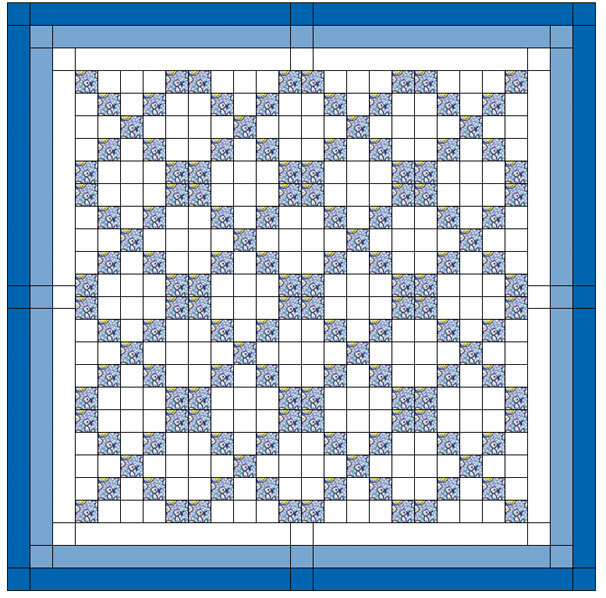 There are 400 2" blocks in this top, 144 of them blue and the rest are white. 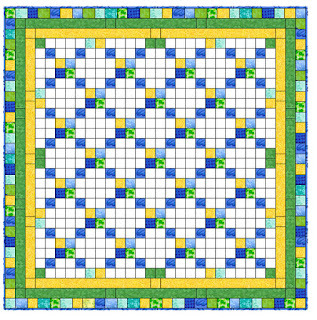 Add 3 2" borders, and the overall dimensions will be 52" x 52". 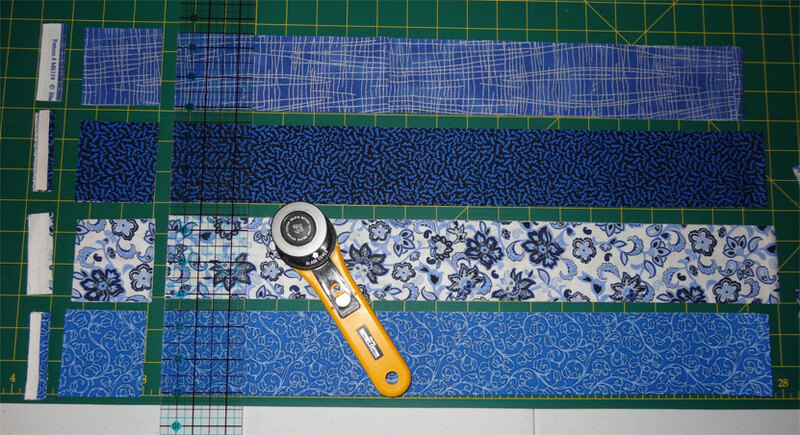 There are 40 strips in the jelly roll, and I can get 17 two-inch squares from a strip. I've got more than enough, then to make this quilt 4 times if I want to. I found a new source of interesting fabrics online: www.fabric.com. They sell a wide range of different fabric, including quilting cotton. It's a bit of a gamble to buy quilt fabric online, you're at a disadvantage without being able to touch the fabric and examine it up close. But If you stick with known manufacturers/name brands, it should be OK. The costs, after the exchange rate between the US and Australia, plus postage come out to slightly below what I'd pay (retail prices) at shops here. So I found a few interesting panels with designs that I haven't seen in shops here. This quilt is one of those. The center panel has 6 bluebirds surrounded by Black-Eyed Susans. 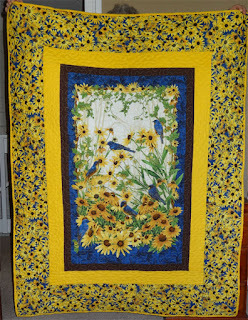 I bought the panel and the flower print in the border online, then supplemented with solid homespun from my stash (the solid brown and solid yellow borders). The finished size is 45" x 62". The binding and backing are the same solid yellow as the inner border, and the stitching is done in butter yellow thread. I chose yellow thread because I was certain it would be the least obtrusive. That was true mostly, but the quilting was done using my "Simply Stipple" groovy board, and I ran into trouble when I stitched over the birds - really not the effect I was wanting. So I picked out the stitches on the body of this first bird, then outlined the birds before going around them with the stippling. It was a bit fiddly, but worked out OK.
Below you can see the effect - looks MUCH better than having stitches over the bird. 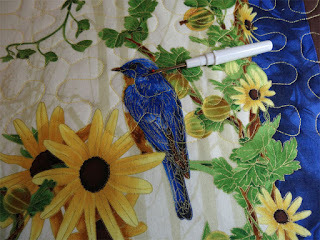 I found it extremely difficult to control the longarm's movement when I stitched around the birds. 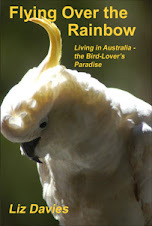 The machine moved in a very uneven way, catching and grabbing, throwing me off the line I was intending to trace around the birds. I really like these panel quilts, but I'm going to have to find a better way to handle quilting around figures like these birds. The results on this quilt are "OK" - but not great, not quite what I was aiming for. Hmmm.... Going to have to have a "think" about all this. This one will be donated to "Inspirational Quilts". I'd set myself a goal to make at least one quilt a month for them, but this is the first one this year, so I'm seriously behind schedule. That's OK.. I'll push myself a bit and get caught up soon.